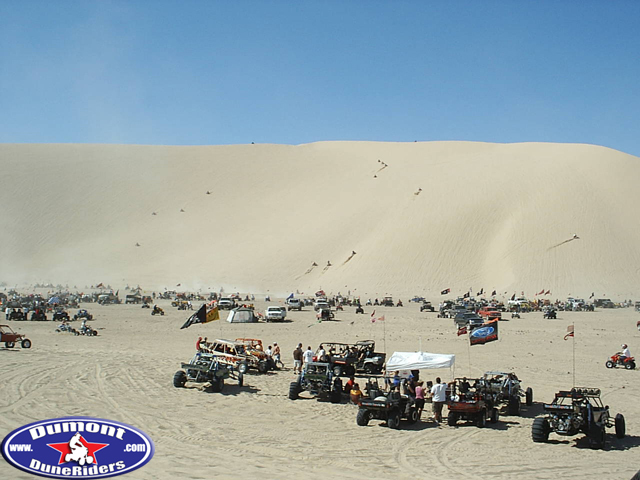 The Dumont North Pole has always been a popular place where you can find duners relaxing and taking a break from a dune ride. The pole is located at the northeastern-most tip of the dunes. It consists of a heavy-duty pole with an attached mailbox where you will find letters to Santa from kids and random notes from fellow duners. Most of the time you will find a magic marker inside the mailbox that some duners use to sign their name on the box. At a decent pace, it is about a 10-15 minute ride from the camp area. Kids love the north pole, but it is a rather long ride for small quads. On a holiday weekend, you can usually find quite the crowd out there. The pole and mailbox were put up many many years ago. Since then it has seen some vandalism over the years but has been restored numerous times by dedicated duners including us here at DumontDuneRiders.com. 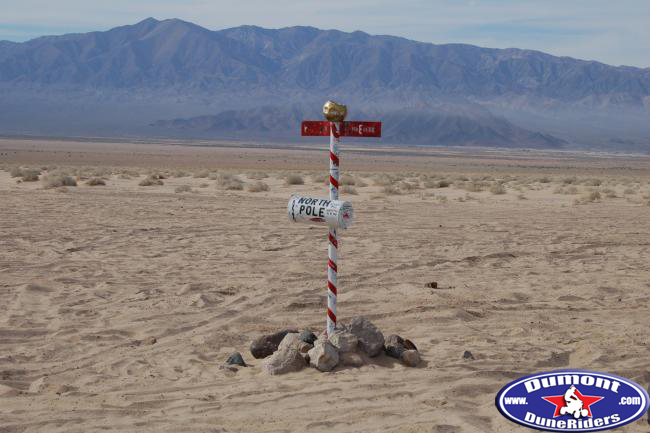 Please note that any off-road travel beyond the north pole out into the desert is prohibited. That area surrounding the dunes is closed to off-road use. Even if you find tracks leading out to other areas of the desert do NOT follow them. Those trails are out of bounds and you will be fined for riding out there. Cooperation with the BLM on this matter will make life easier for everyone. Be a responsible duner and only ride in allowed areas. The South Pole is one of the newer landmarks of Dumont. It was erected by some of DDR's members back in January of 06. It serves as a great spot to meet up with other riders from the site. 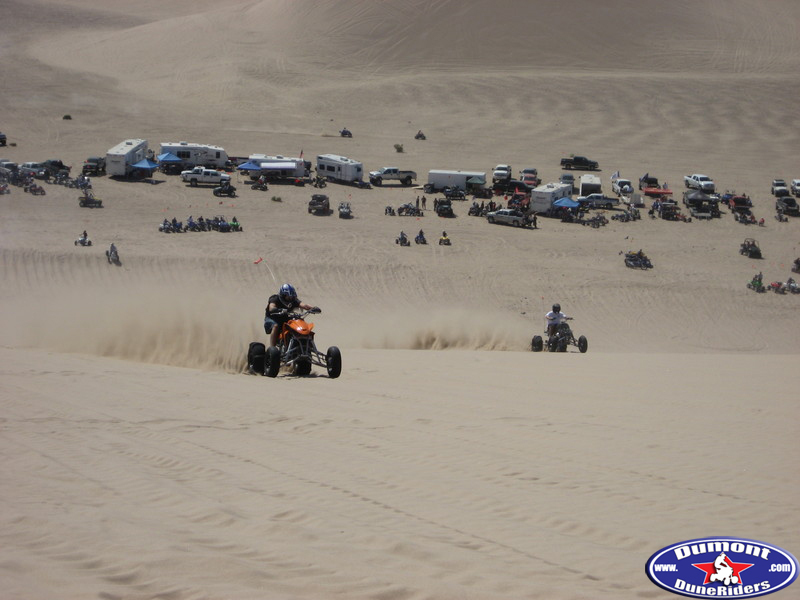 Located in the south end of the dunes, it is always a nice and peaceful place to plan a ride. See if you can find it your next trip out. 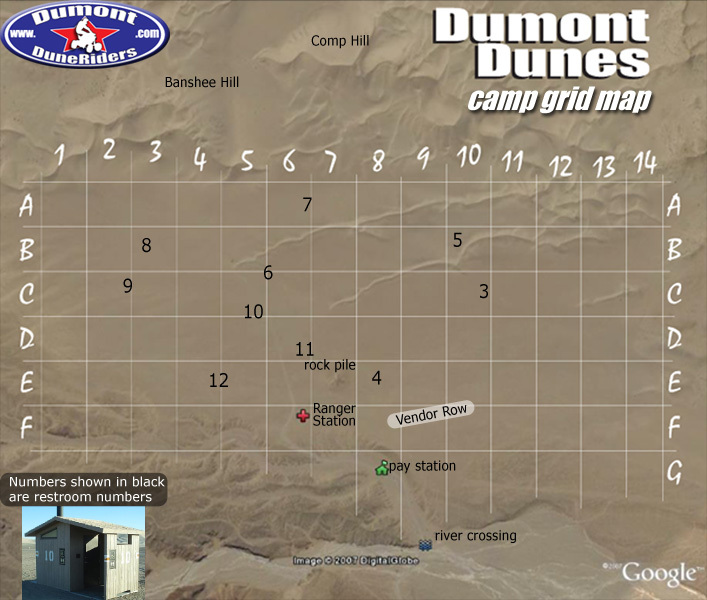 Comp Hill is located in the middle of Dumont Dunes. It is approximately 450 feet tall. Its elevation at its peak is 1200 feet above sea level. Anytime there are duners at Dumont, you will find people racing up comp hill. There is even more action at Comp Hill when the sun goes down. Night time drag racing, partying, and loads of sandrails, bikes, quads, and spectators fill the bottom of the hill well into the night. Comp hill ranges from being very steep (on the left side) to a long, gradual incline in the middle. The left side of comp hill is used for the hill climb competitions on Thanksgiving weekend. Banshee Hill is the home of the hillshooters. Most of the fast hillshooter 450's and Banshees are always found racing up it. This hill is also used for events such as Four Stroke Wars. Banshee Hill has become more popular for quad hillshooting lately because it has grown in size and distance due to the shift of sand over the years. Banshee Hill is located on the left-hand side as you go through the whoops to Comp Hill. 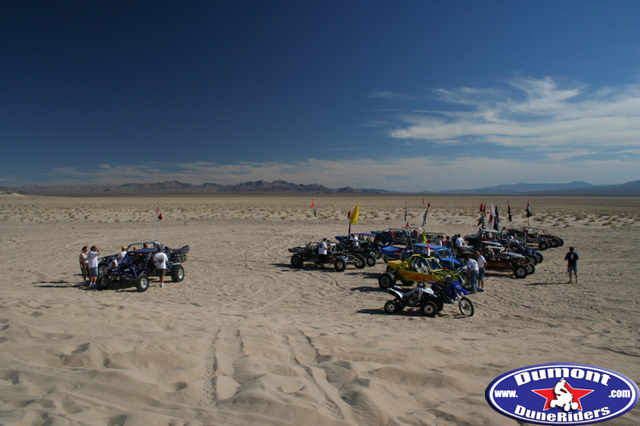 The Superbowl is one of the largest bowls at Dumont Dunes. 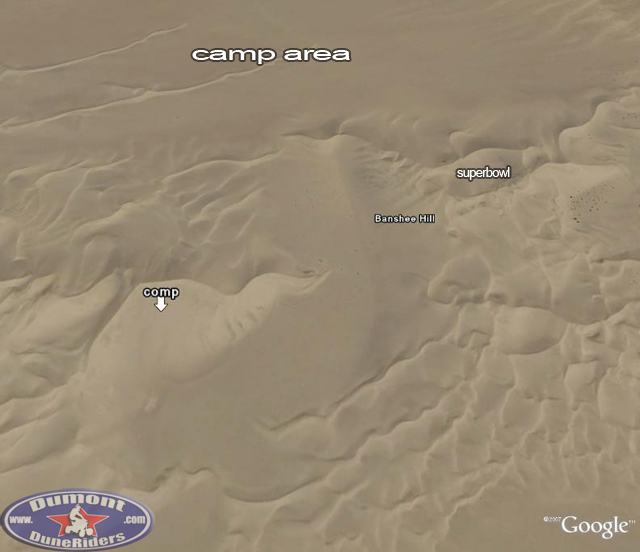 It is located at the northwest edge of the dunes that is adjacent to the camp area. This is not a bowl that you would want to break down in. It is large enough inside it to open up a bike 5th gear pinned! 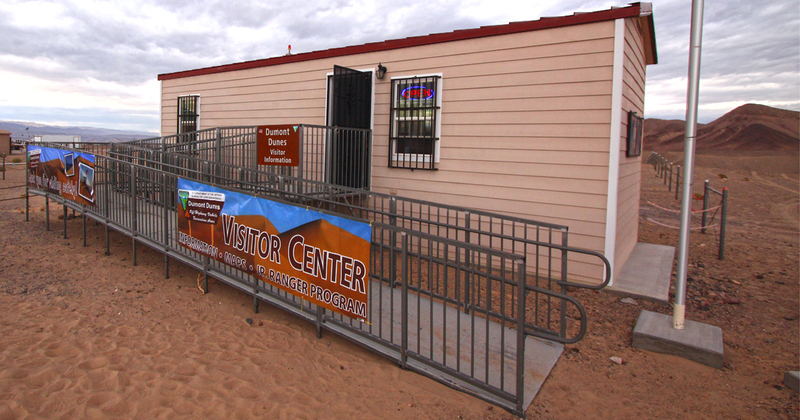 The Sperry Wash offers Dumont visitors a change in pace and scenery. The entrance, which is the wooden ranch style sign is located just before you come to the Amargosa River crossing entering Dumont Dunes. OHV's are not permitted on the main entrance road to Dumont, but there is a small access trail alongside the road to allow for OHV travel to the Sperry Wash from the camp area. These trails consist of mostly pea gravel and dirt so you will want to bring your dirt tires with you if you plan to ride the trail. You will also find a few shallow river crossings throughout the trail that make it that much more of an adventure. 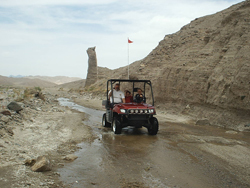 OHV use is limited, however, to certain areas of the Sperry Wash. Riding is only permitted along designated trails. The trail snakes through canyons and takes you many miles through the desert. Most people pack a lunch and plenty of drinks as it usually takes a few hours to go through and come back. 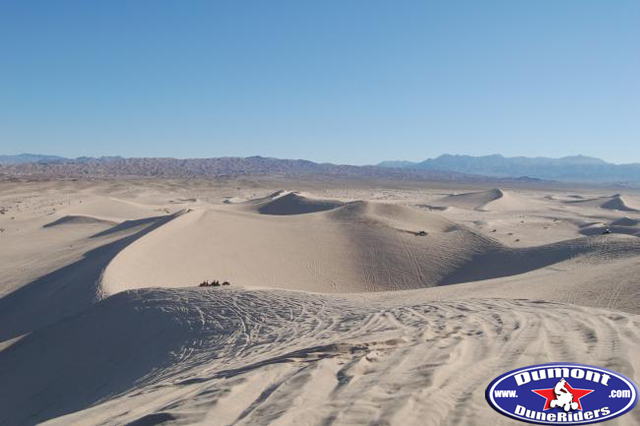 Also referred to as Little Dumont, the Little Dunes are located right off highway 127. These dunes are most frequented by families with kids. 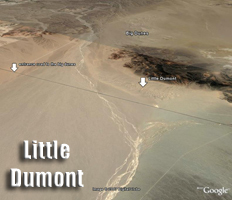 There are no big hills or dunes at Little Dumont. All the same rules as the main dune area apply over there as well. There is a trail that connects Little Dumont with the Big Dunes. It is fairly long and dirt tires are recommended. Even though Dumont has no permanent stores or facilities, on a holiday weekend you can find just about anything out at Dumont's Vendor Row. 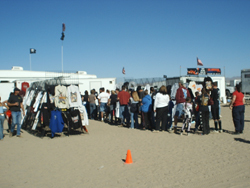 Grab a holiday event t-shirt, ATV parts, firewood, ice, funnel cake, BBQ food at the Famous Hog Heaven and much more. You name it, vendors from all over the place come out to sell items at Dumont on the big holiday weekends. Some vendors are even out there as much as every other weekend from October through April. Next time you go to Dumont, stop by and help support the vendors. 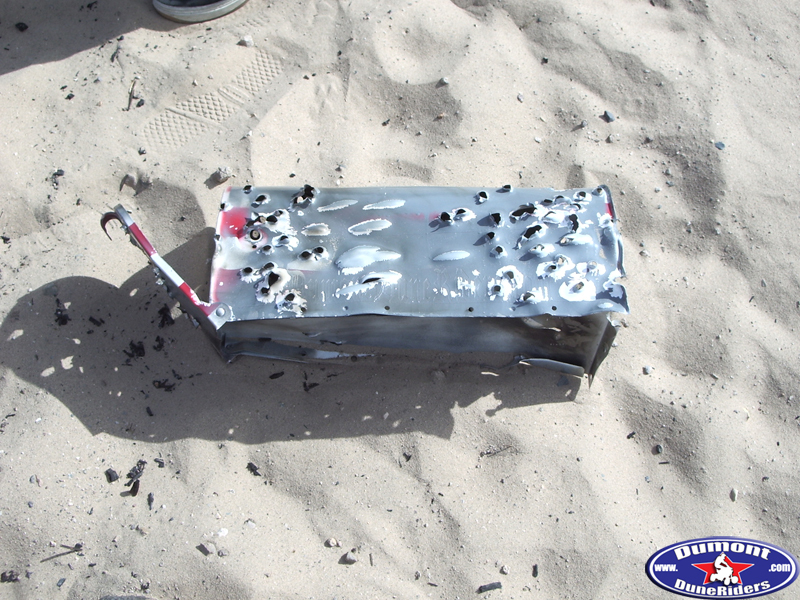 They make our lives much easier if we are in need of something during our dune trip. 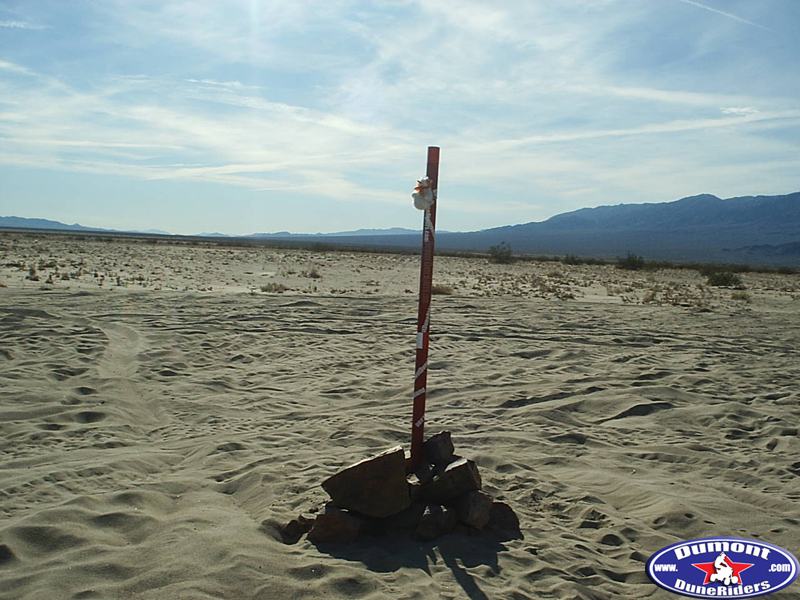 The Ranger Station at Dumont Dunes is located just off to the right of the entrance road as you approach the top of the plateau entering Dumont. The Ranger Station is usually set up on the busier weekends. On these weekends the BLM has medical staff and rangers on duty. The Ranger Station has many trucks, ATV's and even a sandrail with a flat board for emergency responses. They usually have a helipad with a Flight-for-Life helicopter as well.